Did you know that people spend an average of 3 hours a day on their mobile devices? Spending hours on your mobile device can have its rewards, you just have to download the right apps. Apps that actually give you something in return, simply by doing the things you do every day. How? By performing the simplest of tasks like trying out a game or answering a few survey questions. You can do this during your idle time, when commuting, or while waiting in line. Take out your Android smartphone or tablet, connect to an available Wi-Fi network, and then go on and download the Free Paypal Cash app. What is Free Paypal Cash? This is a reliable, easy to use and neat Android app that enables its users to earn free gift cards and PayPal cash. It is created by a hard-working developer team, Supreme Wallet LLC, who designed it with great graphics and various awesome features. The answer is simple - Free Paypal Cash is an app that actually pays you in gift cards and PayPal cash. All you have to do is install it on your device, signup with your Facebook or Google account, watch videos and download free apps from the Store, and redeem everything that’s yours. 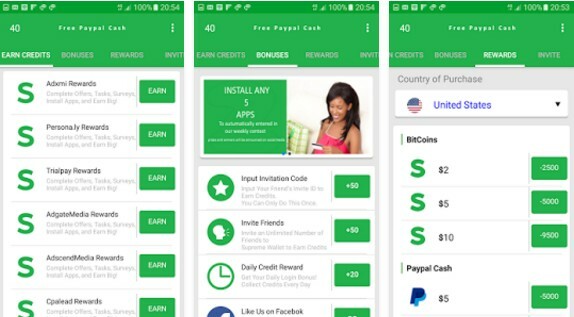 You will have the chance to earn PayPal money and all kinds of gift cards, from Amazon, Google Play, Xbox, PlayStation, Steam Wallet, Apple, Walmart, Target and many more. You can download the app for free from Google Play. Don’t forget to share it with your close ones!